Give yourself the same parking options as other big touring bikes! 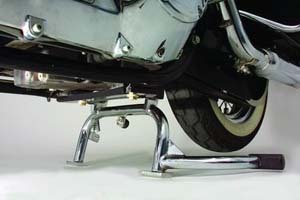 True Center-Stands for the Electra Glide, Road Glide and Road King platforms. These fine products requires little effort to operate. They allow for additional parking options and use of less space (about 1 foot) when parking the bike. Greatly simplifies cleaning and maintenance. The Center-Stand weighs only 8 lbs. and you lose no ground or cornering clearance when the bike is underway. CS-H Models: Lifting your bike upright and off the side stand is ideal for cleaning and servicing, and reduces the space required for parking - handy where space is at a premium in a crowded garage, a small parking spot, or at a ride-in bike show. 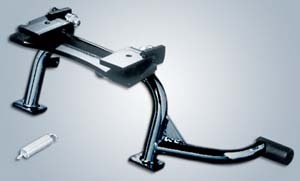 The robust Chrome Center Stand attaches directly to the frame and does not reduce the lean angle. 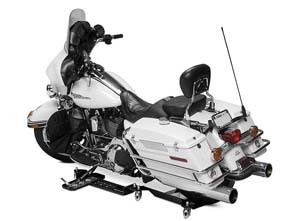 Designed to work with all Original Equipment suspension configurations and with Profile suspension lowering kits, the adjustable feet can be set to lift the rear tire clear of the pavement, or to keep the rear tire on the ground for reduced lifting effort. 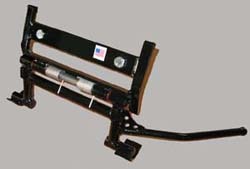 The lifting lever is inconspicuously tucked away, and fits '09-later Touring models (except FLHTKSE, FLTRUSE, '07-'11 FLHTCUSE and models equipped with Adjustable Passenger Footboard Mount Kit P/N 50768-07) with Original Equipment or Profile Low Suspension. 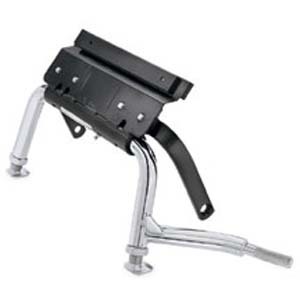 Kit includes chrome stand, black mounting brackets, and all necessary installation hardware. Special order item! CS-R Model: The CS-R models lift the rear wheel off the ground. 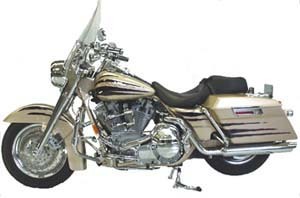 Offered in show chrome or black powder-coat models. The CS-RA model is adjustable for stock and some lowered bikes with lowered ride heights. CS-W Model: The CS-WC, CS-WB, CS-WL and CS-WSL do not lift the rear wheel completely off the ground, taking the bike's weight off the tire, which allows for easy drive-off. The CS-WB is finished in black powder-coat for stock height bikes. 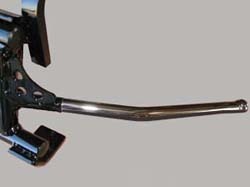 The CS-WC is the same black powder-coat model with a chrome lever. 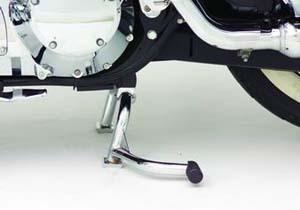 The CS-WL is designed for bikes lowered in the rear only. 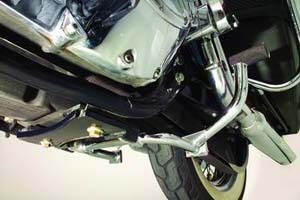 The CS-WSL is designed for bikes lowered in the front and rear. There are also chrome lever versions CS-WLC and CS-WSLC. 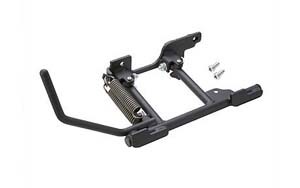 Note: If your bike has adjustable passenger pegs part #7926, with the extended passenger board mount part #4537 which moves the left side foot board out in order to clear the Rinehart true dual exhaust systems you will need to email us as we offer a special version for this setup with the foot lever on the right hand side. They are built in any height needed. Cost is still the same but it will add a few days for shipment. 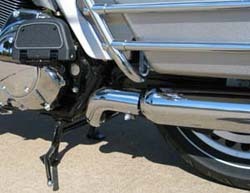 Bike Lowered in Rear: H-D Touring Models with Lowered Rear Suspension (Including '04-'07 FLHRS & '06-'08 FLHX with Stock Lowered Rear Suspension & '89-'08 Touring Models Equipped with Lowered Rear Shocks such as H-D's Profile Low Touring Shocks). 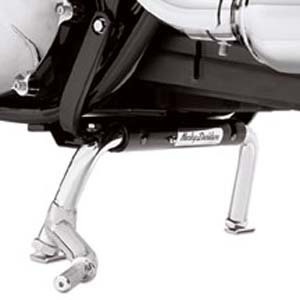 This model is ¾ inch lower than the stock center stand and fits the factory lowered models like the FLHX Street Glides, FLHRS Road King Customs, and any bike that has been lowered with the H-D Profile REAR lowered shock absorbers. 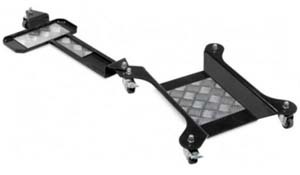 The Center Stands are easy bolt-on installation in 5 to 10 minutes! 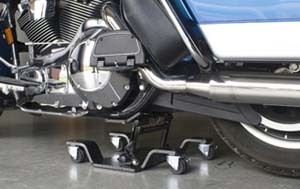 CS-V: This Center Stand for Victory motorcycles provides a versatile alternative to using the bike’s Side Stand for secure, stable parking. 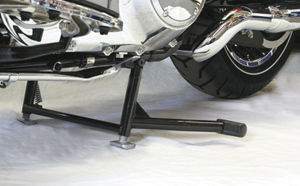 This Center Stand is ideal for use when parking the bike in a tight spot, cleaning the bike, performing maintenance and when storing the bike. 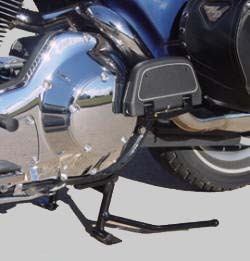 The Side Stand can remain on the bike when the Center Stand is installed, and the rider will have a choice of which parking device to use. Special sale item. 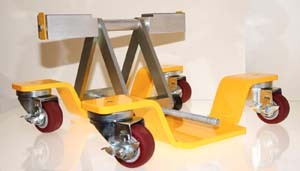 Motorcycle Dolly: The ‘must have’ product for all motorcycle owners needing to easily move their motorcycle around the garage. When space is an issue, allows one person to easily park their motorcycle in any location they desire in the garage. 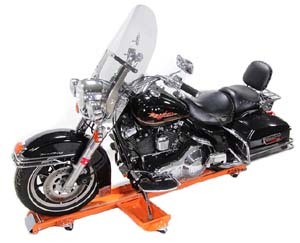 MD-26: Motorcycle dolly lift holds up to 1250 lbs. 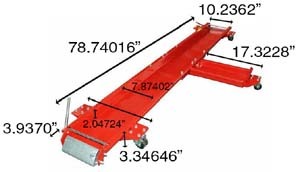 Measurements: Overall Length: 78.74" Overall Width: 15.75", Outer Width: 10.24", Inner Width: 7.87", Inner Height: 2.05" NOTE: Delivered by truck only. MD-54: The solution for parking in your crowded garage. Allows you to fit your ride into the tightest of spaces. Much more stable than full-length dollies and it takes up far less room when not in use. High-quality bearings make moving the folly practically effortless. Made from 8mm heavy-duty, laser-cut steel plate for superior strength. 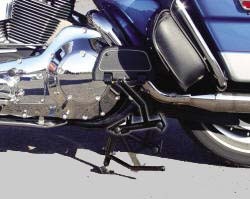 Beautiful steel diamond plate keeps the side stand rails looking great. Total length: 51-1/2 inch, 1,110 lbs. capacity. PNM-01: Park-n-Move motorcycle is the perfect accessory for bikes with center stands which need to be rolled around or repositioned in a small space. 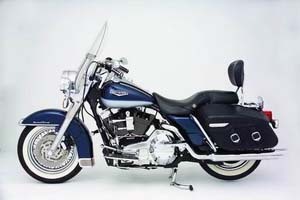 Once your bike is placed on the Park-n-Move very little effort is required to move and rotate a full sized motorcycle. 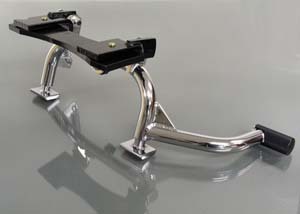 Perfect for the H-D touring bikes with aftermarket center stands. 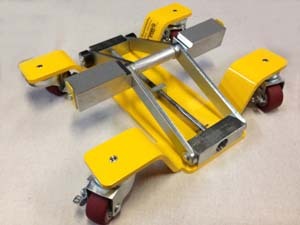 By using 2-inch castors there is plenty of clearance for even lowered cruiser frames. 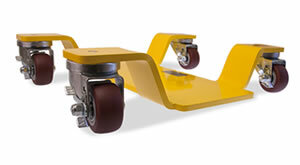 Fully assembled with four locking, heavy duty, 360 degree swivel castors rated at over 1100 Lbs. 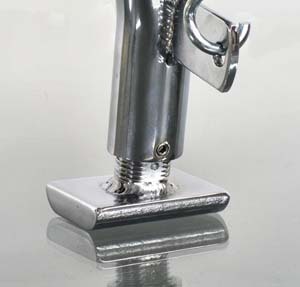 A very durable silver-vein epoxy powder coated finish is applied and offer a lifetime OEM warranty. 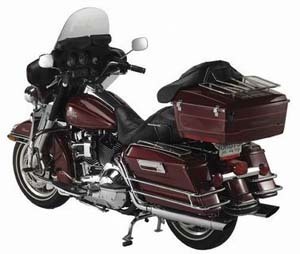 PNM-02: This model is the latest version of the already popular Park-n-Move motorcycle mover. 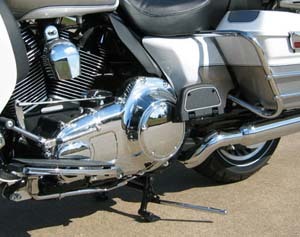 The majority of today’s cruiser type motorcycles do not have centerstands therefore cleaning and maintenance can be difficult. Combine the heavy weight of these motorcycles and parking in limited space can be a real challenge. 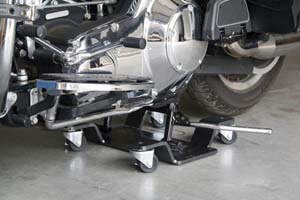 The Park-n-Move Cruiser answers the need for a compact lifting device used for moving and parking motorcycles. 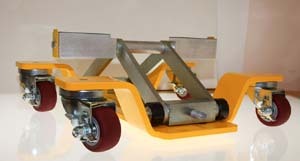 The Park-n-Move Cruiser can be viewed as an upside down centerstand that has been mounted to a standard Park-n-Move unit. 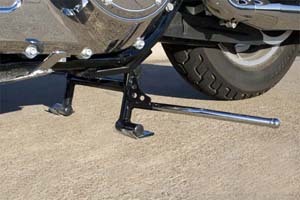 The Park-n-Move Cruiser uses a system to raise and lower the lifting bar that makes contact with the motorcycle frame. 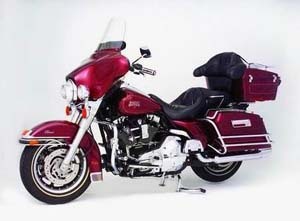 Once the motorcycle is on the Park-n-Move Cruiser, the motorcycle can be easily moved. 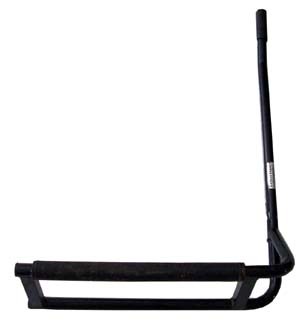 LS-S: Pre-owned Lift Stand. Very good condition. 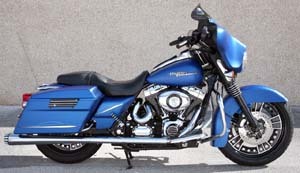 Tested to loads far exceeding that of the heaviest production motorcycles. Features a durable black finish. Replaceable heavy-duty non-marring frame protector pad. Comfortable cushion grip. Need to lift the front wheel? 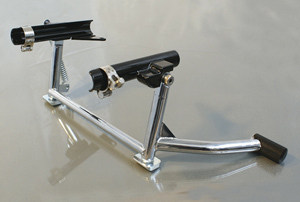 Simply position the stand toward the front of the bike. Need to lift the rear wheel? Position the stand toward the back of the bike.